Welcome to our website we have three shops covering the Rugby and Daventry area. We are proud to be the Midlands longest established family run florist. We offer same day delivery and guarantee a friendly professional service. We know all our customers are different, our team of experienced florists have the knowledge to ensure that the flowers you order for that special occasion are exactly right. 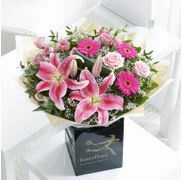 We specialise in bouquets hand tied arrangements, designer wedding and funeral displays. So whatever the occasion in sadness or joy or just to say thank you, order online, by phone or call in at any of our branches and speak to one of our professional team.